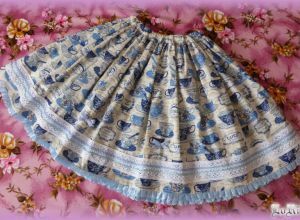 A collection of skirts and pochettes with a pattern of cups in pink and blue. Black-white collection Abica-atra includes dual colored combinations of wristcuffs headbands with ribbons and decorated kneesocks. Black Rose collection in full black is characterized by decorations of rich handmade applications from satin ribbons. 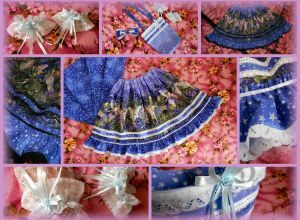 Includes headband with ribbon, headdress and wristcuffs. 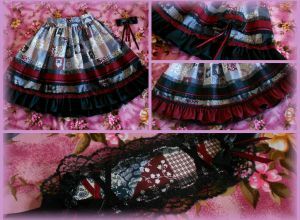 Collection of two skirts Black Wine Almondica is a combination of patchwork style material with fabric in black and burgundy color. Materials are matched by adding a layer of black tulle. Decorated part it makes coherent and thus stand out against the background of varied basic material. Besides skirts also contains a simple headdress. Dryas Nyx, or in other words "Fairy Night" is a skirt of cotton fabric with gorgeous print depicting fairies during starry night. It is combined with another beautiful print of the night sky adorned by stars. 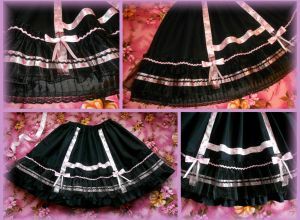 Light - Hikari version is decorated with white lace,the black version - Yami with black lace. The collection includes wristbands and practical decorated bag.